Another great photo... so it is obviously not my doing! You can find these sculptures in Lady Wootton's Garden, in Canterbury. The taller bronze is King Ethelbert, the King of Kent at around 580 or 590. He married the daughter of the King of Franks, Bertha - the samller bronze - forming a very powerful political alliance that eventually led to the arrival of St Augustine and introduction of Christianity in England. 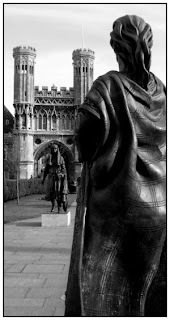 These sculptures were commissioned by Canterbury Commemoration Society and the bronzes were created by Stephen Melton working with Meltdowns. They were unveiled by HRH Prince Michael of Kent and the French Consul General in May 2006. Rose, so good to see you on Eric's video! And of course you are in Canterbury - not London! Hope to make the picnic myself one year - perhaps next year. It all sounded just amazing. Great photo of these two historical figures whom I'd never heard of (I know, shame on me). The positioning of the statues and the church, as well as the black & white make this a compelling image. Your daughter is indeed an excellent photographer! (However I refuse to listen to you downplay your own photographic abilities! Enough of that nonsense.) Did people call them Ethel and Bert? Or Ethelbertha? Hmm, probably not. It was a blast to see you on the PDP video Rose! Love all your necklaces too! What a beautiful city you live in. I'll come for the Canterbury Daily Photo picnic some day.